Lighted treaded easy clean outsole with removable eva insole. Two pull handles for easy on and off. No mom needed! Plush cushioned footbed to provide comfort for all day play! 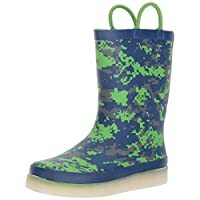 Waterproof rubber upper with a fun bright print to make each rainy day better! Waterproof rubber upper stylish to match any outfit. The boot lights up with every step taken. Last up to 30,000 steps! PVC Upper with fun print! Soft-touch moisture-absorbent polyester/cotton lining. Removable eva insole for comfort. 6.5" from arch to top of boot. DUAL SIZING| Sizing runs closer to the larger size listed. These cute Western Chief™ Hydrangea Blooms Rain Boot will have you dreaming of May flowers. 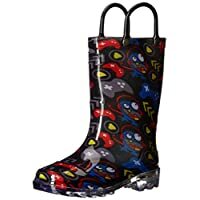 The Western Chief® Kids Paintball Splat Neoprene Boots are perfect for fun no matter the weather. Textured mud guard and toe cap for durability. ADJUSTABLE | Each boot as an adjustable strap with an expandable insert to allow you to change the diameter of the boot opening depending on thickness of pants or socks. OUTSOLE | Western Chief out soles are completely Non-skid rubber to increase traction on wet or dry surfaces.We want to keep your feet dry on the rainiest of days. Boots do tend to run about a 1/2 size larger. perfect for sock liner! Waterproof rubber upper with a circumference about 15"
This rain boot from Western Chief features easy-on pull handles and a grippy tread. 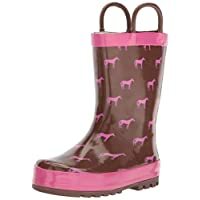 The Western Chief® Kids Limited Edition Printed Rain Boots are sure to bring a little sunshine to the dreariest rainy day and smiles to your little lady's face. Just in case a few raindrops sneak in the moisture-absorbing cotton linings will do the trick. Lightly treaded rubber outsole. Imported. Weight of footwear is based on a single item, not a pair. Waterproof rubber upper with a circumference about 14"
Slide through the drops of rain with the Western Chief™ Dot Pop Wide Calf. Let the best part of your day be the playing the rain with the Western Chief™ Camolflorage Pop boot. When it comes to your style, there can only be the Western Chief™ Stripe Dot Rain Boot. You can jump in as many puddles as you want with the Ikat Damask rain boots! Rain won't spoil your romp through the flowers with the Abstract Bloom rain boots. Brighten up a dreary day with these charming Western Chief™ Mandala Dot rain boots. Keep yourself grounded of rainy days with the Printed Rain Boots by Western Chief™. Dance in the rain with the fashionable Western Chief™ Fleuria waterproof rain boots. Reflective top will make kids glow at night! Slide through the drops of rain with the Western Chief™ Lacey Floral Wide Calf. Boots may run a little big as it is a rain boot. 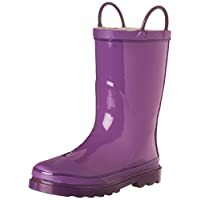 She's full of glamorous fun with these adorable rain boots! Boot does run about a 1/2 size big. Comes in both wheat and black! Fashion driven lifestyle boot, so she can dress up like mom. She'll light up the room with fashionable fun in these sassy sneakers!